As it has turned out recently, TFilter is being used by many leading corporations in the Semiconductor, Consumer Electronics, Medical Devices, Transport, and Power Generation industries, major Universities, and an Aeronautics Research Agency (non-exhaustive list). Should you require Additional Features, Enterprise Features or Services, please contact peter аt almafa dоt org, or fill out the feature request form. This free online IIR design tool is a part of a bigger project called almafa.org. The idea is that you will be able to perform engineering calculations in your browser, share your work easily, and reuse what others have shared. The sharing features are still missing, but you can already test the calculation engine. Please note that the generated code is faster if the number of the taps is a power of 2. If you like this app, buy me a beer . 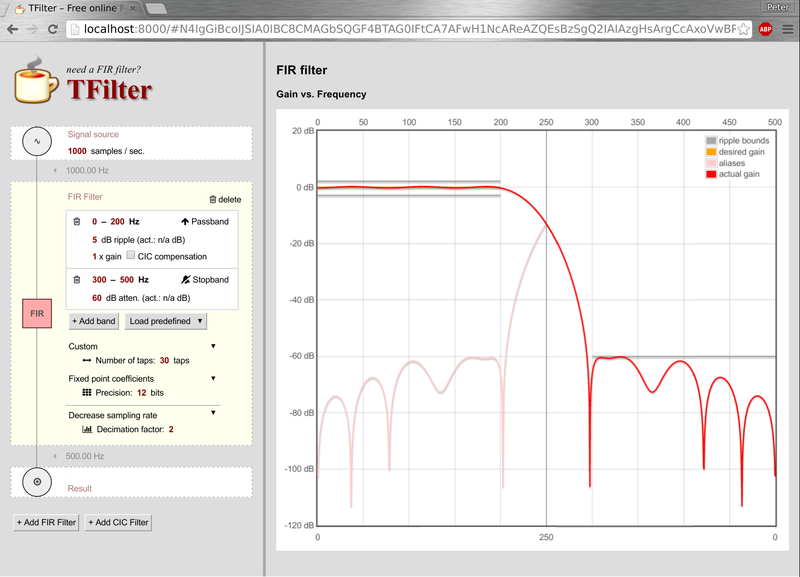 I am working on TFilter2. Screenshot here. Features include CIC (Sinc) filters, effect of quantization, save/load/share, aliasing visualization, and signal chain. If you want to advertise here, contact me at . TFilter is being used by many tech companies and universities. Set the sampling frequency and the desired number of taps. Specify the passbands (gain > 0) and stopbands (gain = 0). Make sure they don't overlap. Click the DESIGN FILTER button. An example configuration is set up for you. To try it, just click the DESIGN FILTER button. The author disclaims all possibly disclaimable liabilities related to TFilter. There is no warranty for anything either.